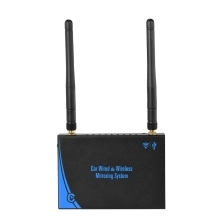 The Car WiFi Display Receiver is the most cutting-edge high-tech product, which is specially designed for transmitting multimedia contents (audio, video, pictures) of Smart Phones, Tablet, Notebook to the car monitor and other big-screen devices (such as, HDTV, Projector, Monitor, etc) through WiFi Standard Protocol (Airplay Mirroring, Miracast, DLNA and Windows WIDI protocol.). PTV888 product also can enhance your TV / Projector / Monitor which have HD input socket and supports resolution of video is up to 1080P. With the PTV product, you can also surf the Internet, play online video & games on Big Screen, which creates a wireless big screen experience and realize Airsharing. Supports Airplay Mirroring (IOS mirror), Miracast (Android mirror), Windows WIDI, DLNA (Note: 4 functions in 1, no need to switch mode. For the first time use, please read the instructions). Supports Online Push: When the smart devices and PTV888 are in the same wireless local area network (WLAN), at this time, your Smartphone is a remote controller, which can play whatever you like on Big screen. In the network condition, use DLNA supported apps to push. (Open player–touch DLNA on control bar—Online push to BIG screen).Also supports Local Push (Support photo, music and video push). PTV888 not only support 5G / 2.4G WiFi wireless Mirroring Display, but also support Wired Mirroring Display Specially which is designed for iOS mobile devices (Support iOS 4.0 or higher), including for iPhone 7 7Plus 6S 6s Plus, for iPad Mini4 iPad air pro, etc. Video Formats: AV1, MP4, MOV, VOB, DAT, RMVB, WMV, FLV, DIVX, MKV. Audio Formats: MP1, MP2, MP3, WMA, WAV, OGG, OGA, APE, FLAC, AAC, M4A, 3GP, DTS, AC3, TrueHD, etc. Image Format: JPEG, BMP, GIF, PNG, TIFF. File Formats: PDF / MS Word / MS Excel / MS PowerPoint file. When use Wired Mirroring Display Mode: you just need connect you iOS mobile devices to the Standard USB (OTG) port to achieve Wired Mirroring Display, also can support charging function. 2. USB Standard: 5V 1A. Input Voltage: 5V / 1A.